I'm excited to start my Seven Weeks of Christmas Giving programme today! 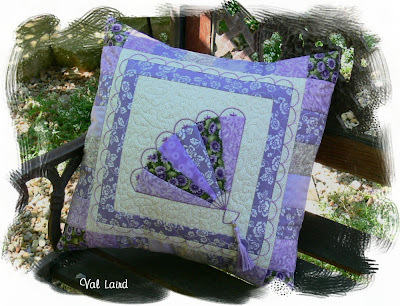 The first free pattern I have for you is a Cushion Cover. The Fan Fantasy cushion measures 41 cm sqaure (16 inches) and consists of simple piecing and easy applique. The fan and border are embellished with a little bit of stitchery and a tassel finishes it off beautifully. Of course you can make it in your choice of colour, if you don't like my favourite purple!!! It's a good pattern to use up some of your scraps too! The pattern will be available for just one week and then it will be replaced with another free pattern for Week Two. To download the Fan Fantasy Cushion pattern, go to my Website where you will see the link to the pdf file. If you use the pattern, please share a photo so we all can enjoy your handiwork. I've just arrived home from the Retreat - fabulous time, but more about that next week. SOMething = Start of something big! Look out for another free pattern in a week's time ... and don't forget to tell your friends about my Seven Weeks of Christmas Giving! Thanks, Val, it's quite lovely. Ooh Val that is just darling - thank you so much! You are an absolute doll to do this! I love your little beehive's too and the cupcakes are so sweet!